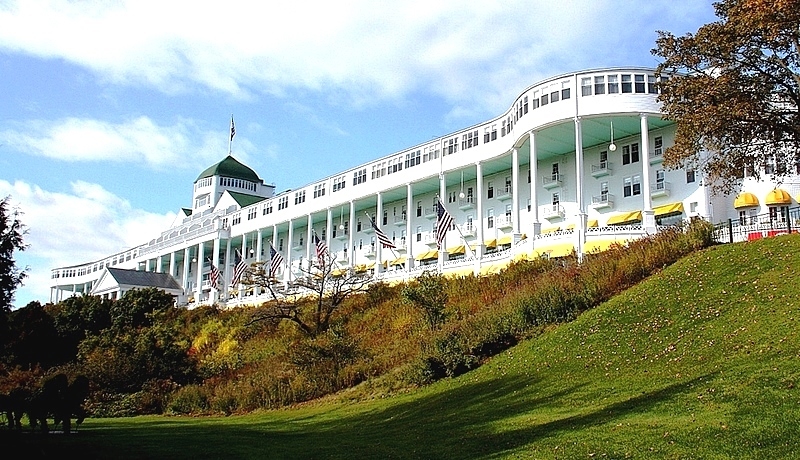 The romantic movie Somewhere in Time was filmed on location, and premiered at the Grand Hotel on Mackinac Island, Michigan in January, 1980. 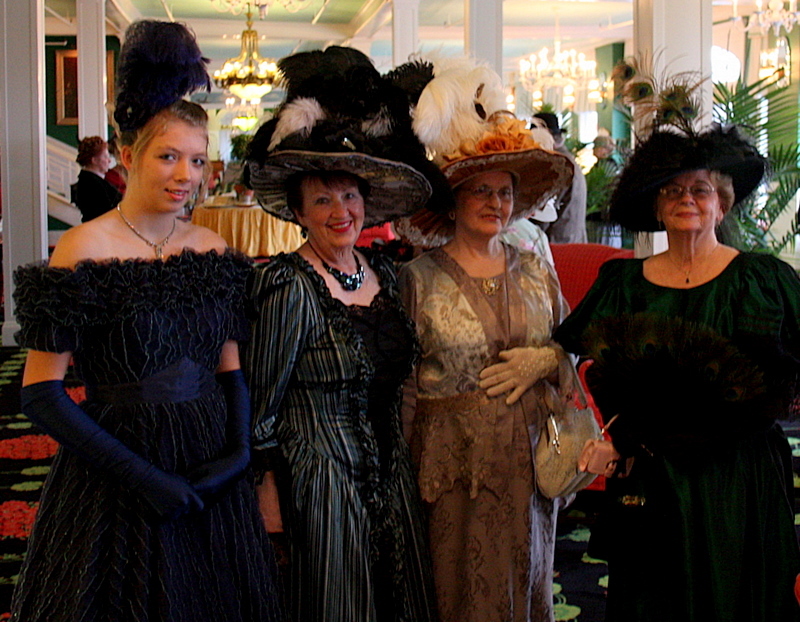 Since that time there has been an annual Somewhere in Time celebration weekend at the hotel. We were invited to attend the event, and are so glad we did. Somewhere in Time was overlooked by the critics when it was released by Universal Studios in 1980. Nevertheless, the touching story of one individual’s search for true love across the spectrum of time eventually caught the fancy of moviegoers around the world. It is now a cult classic. 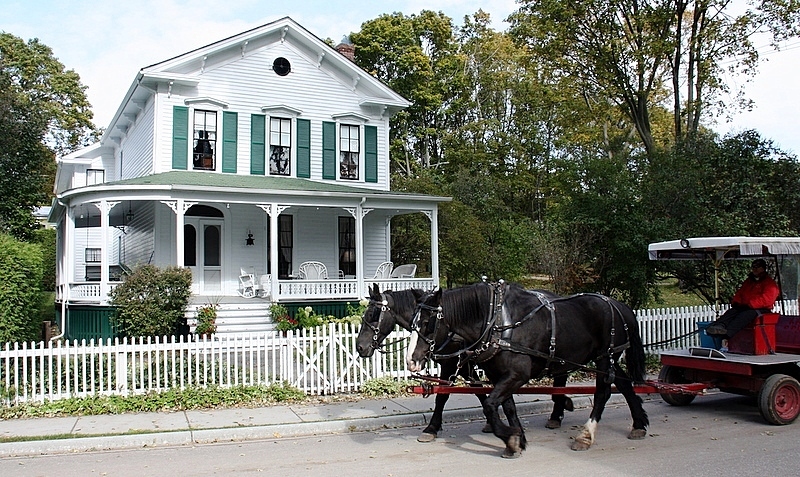 Mackinac Island (pronounced Mack-in-awe) is situated between Upper and Lower Michigan and is the perfect location to reenact bygone Victorian times. There are no public cars or trucks allowed on the island. 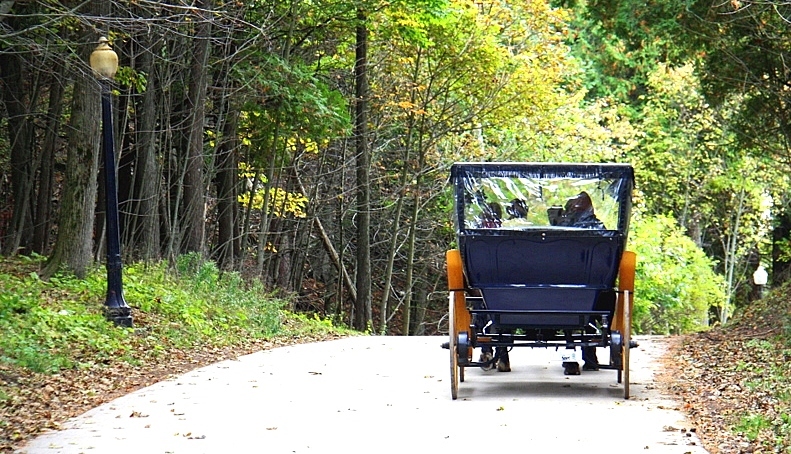 The main modes of transportation are horses and bicycles. The image above shows guests arriving at the hotel from the ferry. The island is also home to many classic Victorian buildings. The period architecture is so significant that the United States government has declared the entire island a National Historic Landmark. Men and women from all walks of life, and from all over the world, gather to celebrate what they believe to be a remarkable cinematic treasure, and to share a common interest in romance and Edwardian apparel. 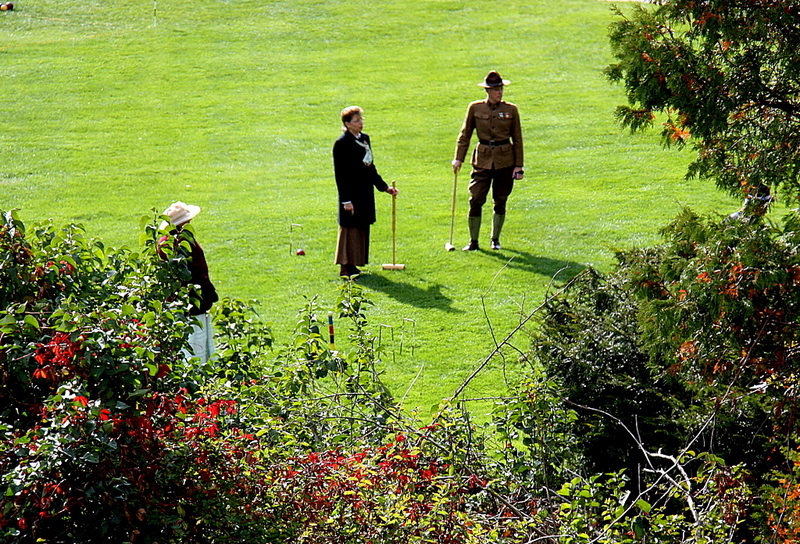 They come to recreate – if only for a short time – the idyllic life of the gentry at the turn of the 20th century. 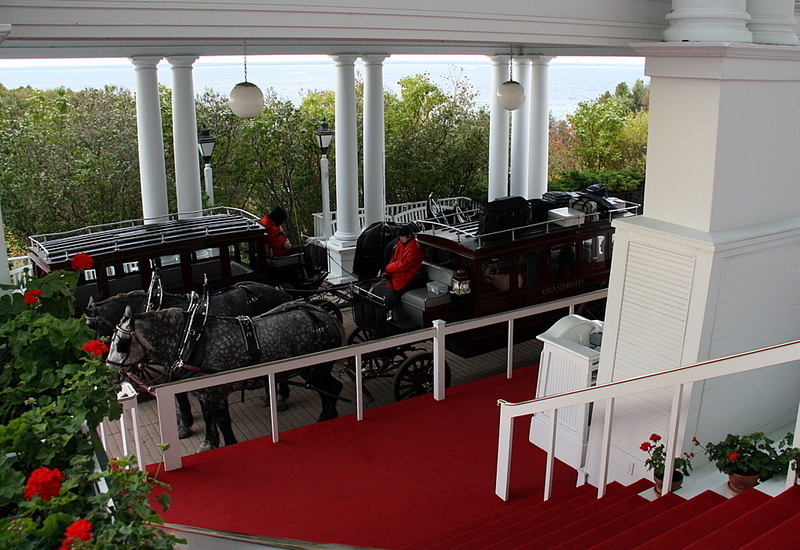 The Grand Hotel on Mackinac Island was a brilliant choice for the setting of the film. 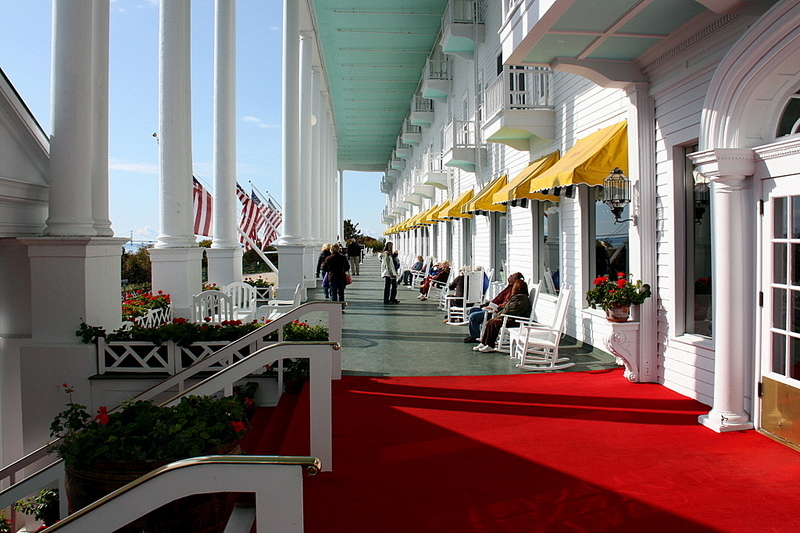 The hotel opened in 1887, is a truly magnificent structure, and the undisputed grand dame of summer resort hotels. 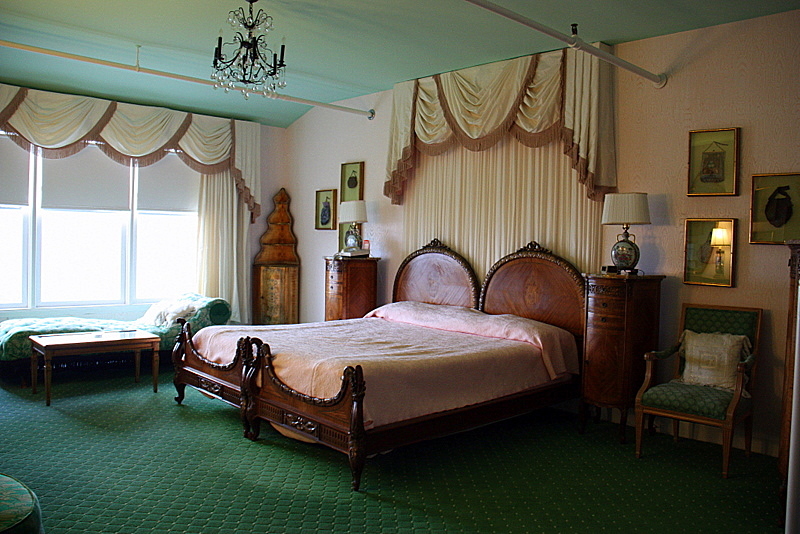 Our suite, like many other guestrooms, was furnished with elegant antiques — making the Grand the epitome of Victorian charm. Once seen, you will not forget her spectacular 650-foot veranda – lined with spotless white wicker rockers, and a porch full of flowerboxes laden with hundreds of brilliant red geraniums. The Grand is an immense hotel that sits like a sparkling brooch on a forest green dress. 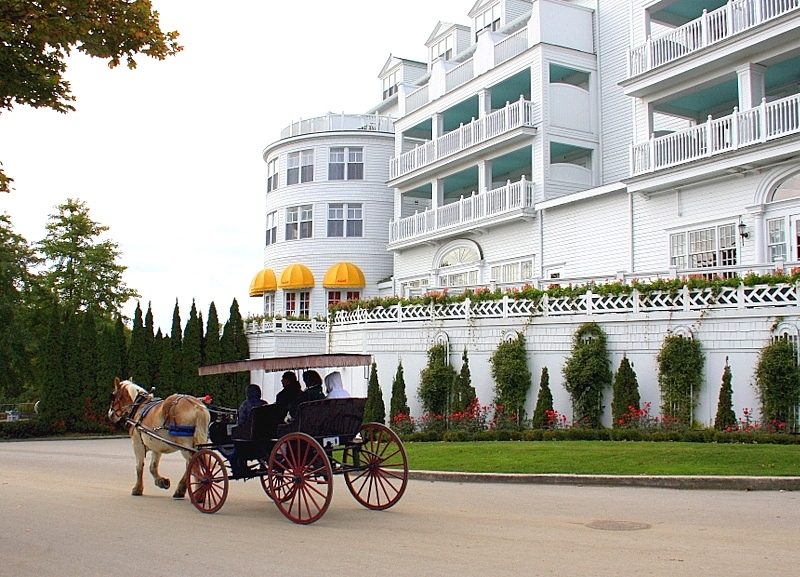 Her shining white exterior can be seen for miles across the Mackinac Straits. 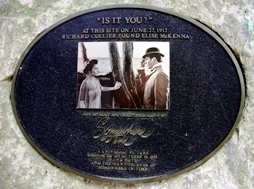 She also overlooks the picturesque Round Island Lighthouse, a prominent fixture in the movie. 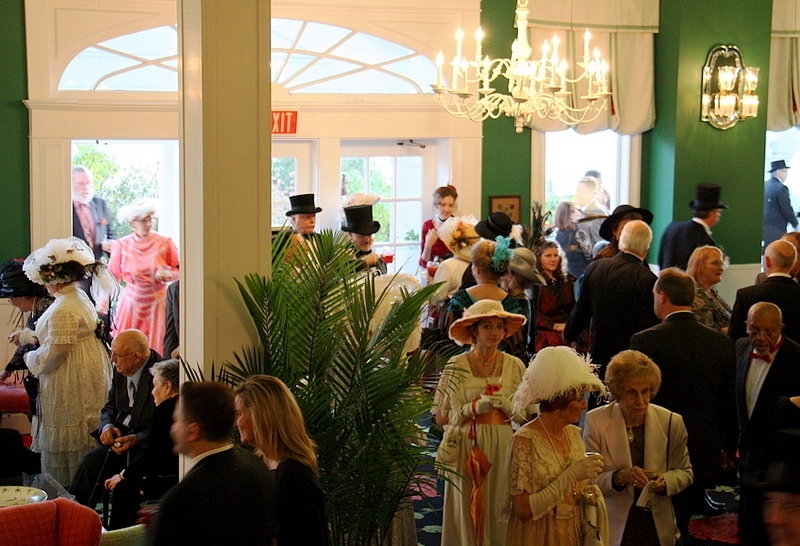 During the event, the Grand’s large dining room is the site of a constant parade of Edwardian fashion. 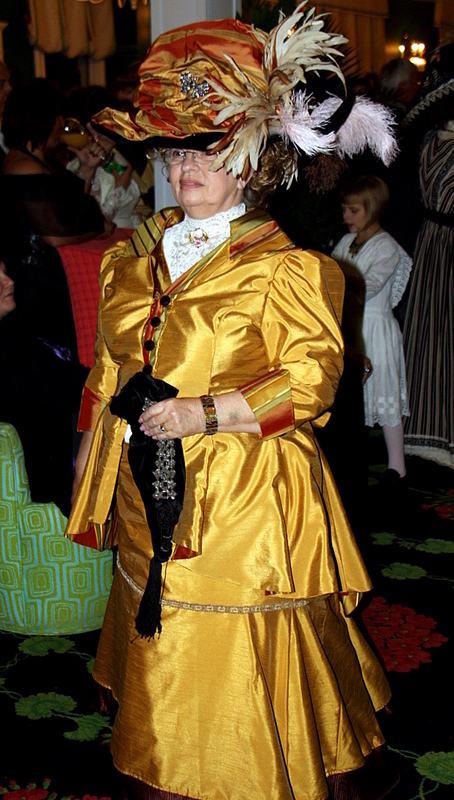 Ladies in fine embroidered gowns adorned with lace and finished with elaborate plumed bonnets – some of enormous size – are accompanied by men in top hats, tails, and spats. Add dozens of bustling tuxedoed waiters, gliding from table to table, and you have the perfect reenactment of a Victorian gala. 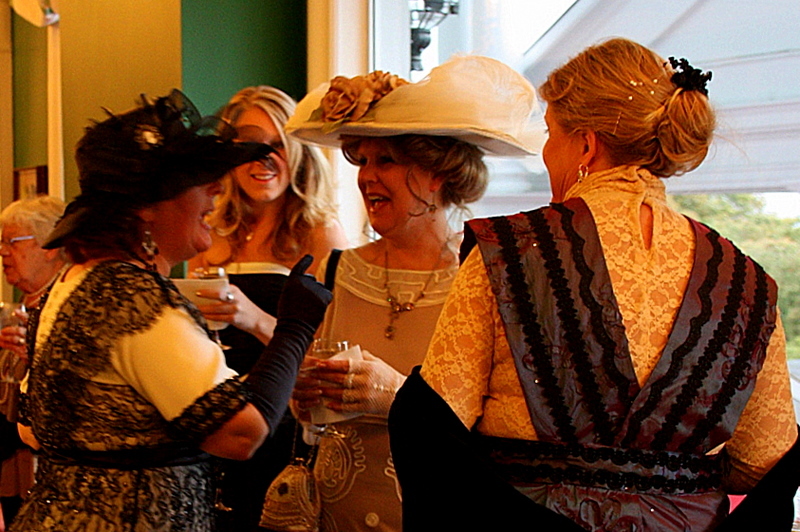 On the final night of the weekend, there is an elegant parade where all guests are invited to strut their stuff in their finest vintage garments through an admiring gauntlet of hundreds of fans. Once each year, the moving story of Richard Collier (Christopher Reeves) and Elise McKenna (Jane Seymour) brings to life the romantic spirits of hundreds of ordinary people. They gather to have fun, enjoy watching their favorite movie, and mingle with fellow enthusiasts. If you have not seen the Somewhere in Time film, we suggest you rent it. The story and inspirational music may stir your emotions. If they do, maybe we will see you next October at the annual Somewhere in Time weekend. 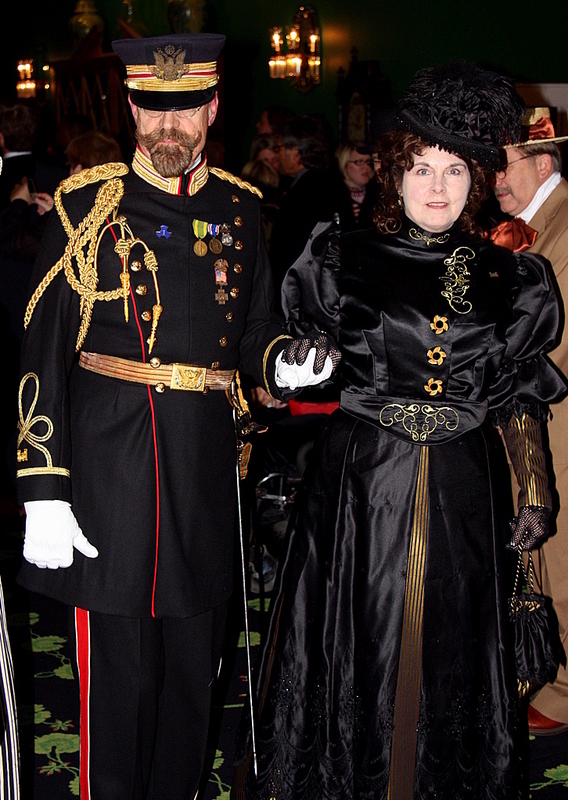 For more facts about the Somewhere in Time weekend click here. For information about the spectacular AAA Four-Diamond Grand Hotel, click here. 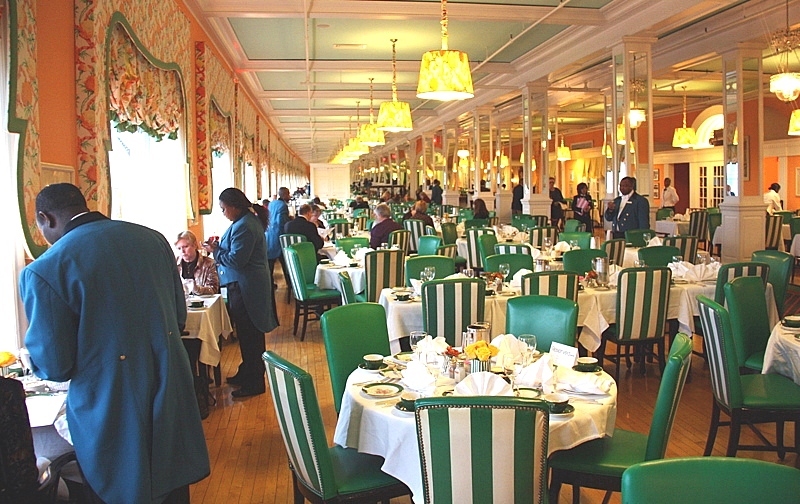 For quality ferry service to Mackinac Island, click here.